* Please, any mod for move this thread to right section if needed, thanks. *Sorry my bad english, my main language is spanish, thanks. *Bala... when back to play? AOManager is an application made for minimizing RAM usage by AO clients. 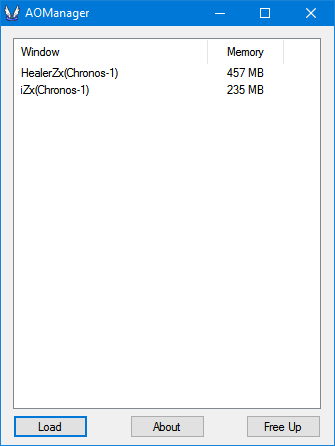 I was wondering why ao uses like 400mb of ram (the answer is, ao loads all things to ready to use), and later opening more AOs, the rest ones, decrease the usage of them, so i made this app for reduce the use of these and a possibility to open more AOs quantities more faster. Open app as admin, next, click on "Load". App will display all AO windows opened with details in the list (details = memory used (RAM)). Later click on "Free Up". 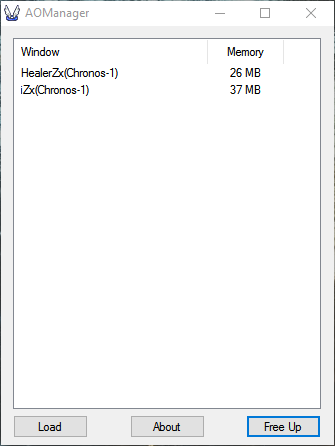 Doing this, App will reduce the consume of AOs with more than 100mb of ram. just wait for it ends. New: AOer: now you can open many AOs as you want, also there a delay option. Add: Counter which show the amount of AOs opened with a small gif for simple UI. ¡You should put it on AO Folder and open as admin! If ram decrease on process, but still high usage of ram in windows, just wait, windows need to recollect data then increase the available ram one by one. Please, do not abuse with this, i dont know what problems can bring, use at your own risk. 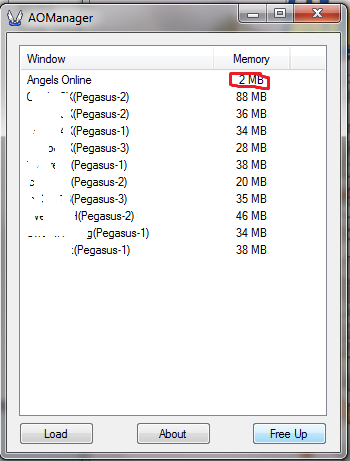 You can increase the virtual memory of windows for open more AOs, but remember, all depend of you ram. You are playing with the system memory, is dangerous. ¿Want more apps? Just give ideas! damn this would help me so much!!! i wish it can use in Windows 7..
Just remember guys, this isn't an official app. For all intents and purposes it has nothing to do with the creators of AO. I'll check it when it's posted on here. You use this at your own risk as with all player made applications. i don't have any ao that has more than 100mb , why is that? 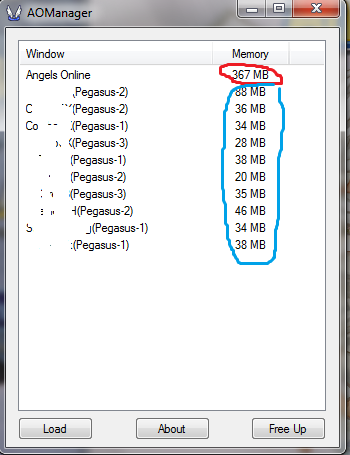 they are all 20-30 mb... what am I doing wrong?? Would you mind sending me the source? I'm curious what you're doing here. If you don't mind. note: if you open more AO window after you did the "Free Up", those new tabs wont be affected, you just need to do again. I love you, with all my strenght! Years old program that does the same thing but for your entire computer, not just Ao. Same, I use this, or you could just open another program that eats up more ram. Cute app though. Nice job dude !! I am loving that !!!!!!!! !